Meanwhile trouble is brewing as the new Queen, attracted by Plok's flag, has been tracked down by Galactic Ranger Zob, who is determined to protect this precious creature from all who wish her harm. 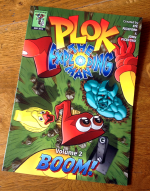 The second Plok comic strip edition collects episodes 27 to 49 of the webcomic and includes many exclusive extras. » View all 23 episodes of Volume 2 as a single long webpage. All 23 episodes of Volume 2 are available to read - for free! - right here. Rockyfella goes to his happy place. Xbone comes close to finding friendship. Wubba explains how game development works. Plok and Wubba meet a new acquaintance. Plok and Wubba meet a new friend. Zob executes a perfect take-off. Rocky discovers the cause of the commotion. Xbone keeps an eye on Plok. The news has to wait just a little bit longer. Rockyfella finally gets to tell Plok his news. Zob heads off on the trail of the Queen. A brief moment in time. Wubba and Rocky debate an important issue. Plok pulls himself together. Almost. There's a runt in every litter. Could this be a candy crush saga? Plok sees something he wasn't meant to see. Plok gets annoyed with the lovable pile of junk. 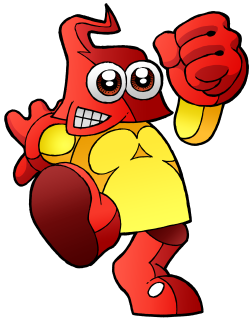 Plok's missing arm is suddenly within easy reach.